I think this is the third time we have prepared this Thai dish and each time we are getting a little better at it. The local Thai restaurant that we go to has a really delicious rendition of it. We have not been able to find an exact recipe for it but have found two that are close and have combined them. As usual my job is to cut up all the ingredients and make the jasmine rice. I use the Instant Pot for the rice. So quick! First John cooks the tofu, then the eggplant. The onions, peppers, Serrano chiles, and garlic go in next and then the sauce which is thickened with cornstarch. The Thai basil goes on last. We are still trying to find the right combination of fish sauce, soy sauce, water, and brown sugar. We keep cutting down on the fish sauce because it is too fishy. Also the vegetables were in the sauce a little too long and picked up a boiled taste and texture. But we are getting closer. The tofu and eggplant came out perfectly! You would simply have to remove the fish sauce to make this a vegan or vegetarian dish. There are recipes on the internet for a vegan fish sauce substitute. 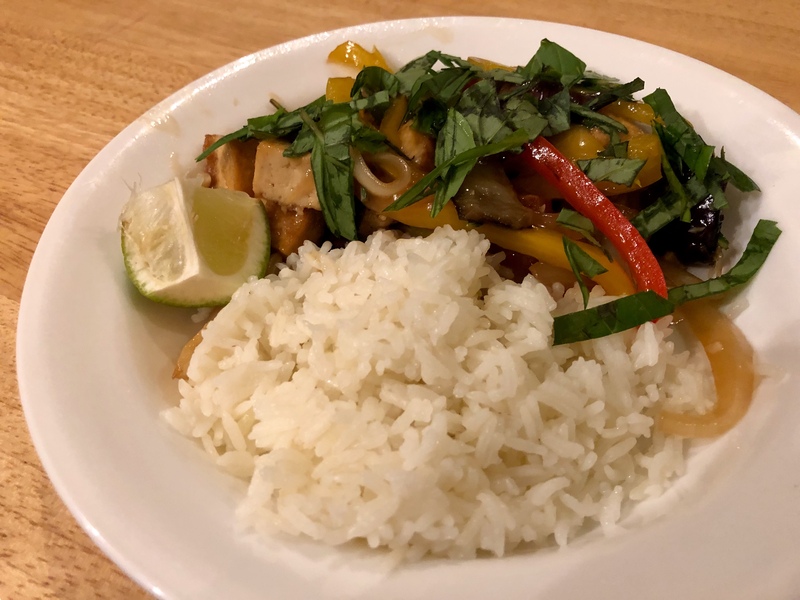 This entry was posted in Instant Pot, rice, Thai, Vegan, Vegetables, Vegetarian and tagged Eggplant, jasmine rice, tofu. Bookmark the permalink.